Most of us understand that cardiovascular exercise, such as running or dancing, is integral to a healthy lifestyle. However, the world seems to be full of misconceptions about strength training. Many people, particularly women, avoid it altogether due to the incorrect notion that lifting weights will make them "bulky." Others believe that strength training is important only for aesthetic reasons and isn't necessary for overall health. The truth is that strength training moderate amounts of weight won't make you "bulky." There's a reason why bodybuilders need to manage their diets so closely and work out so obsessively; indeed, becoming "bulky" isn't something that's unintentionally accomplished by lifting light weights. Furthermore, lifting weights isn't just about a person's appearance. Strength training is just important to a person's health as cardiovascular training is. While you might be hesitant to add weights to your routine, it can truly do wonders for your overall health. It can also improve your performance during cardiovascular workouts. If you're ready to ditch the myths and junk science and add strength training to your routine, here's what you should know as a beginner. The biggest mistake that people make when it comes to strength training is biting off more than they can chew. There's no reason why a first timer should be attempting to benchpress their body weight. A first time strength trainer is wise to begin with minimal weights. Building muscle takes time and there's no benefit to trying to lift extremely heavy weights when you're first getting started. Instead, practice caution and give yourself time to gradually build your strength. If you listen to the cues that your body is giving you, you'll know when it's time to increase your weight. Proteins are the building blocks by which your body builds muscle. Popular sources of protein include eggs, meat and fish. If you're a vegetarian, you can get the protein you need from beans and legumes. However, it can be difficult to get the recommended amount of protein from food sources alone. This is why protein supplements, particularly protein shakes, are so popular. If you can't find protein powders in your local stores, Health365 sells protein supplements online. 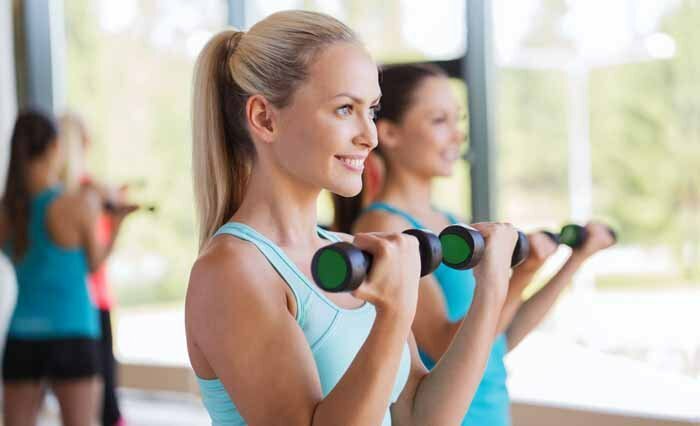 Even if you're exercising caution and starting with light weights, it's normal to be sore when you're first beginning a strength training regimen. The process of building muscle involves creating small tears in the muscle fiber. While this might sound scary, it's completely normal and healthy. However, these tears can cause a dull ache. Stretching before and after can help to ease the pain significantly, as can hot baths. If you really want to prevent and treat muscle soreness, try adding yoga to your exercise routine. While some soreness is normal, extreme pain is not and is typically a sign that you did something wrong. Routine muscle soreness should feel like a dull throbbing, perhaps exacerbated when you move the muscle in question. However, if you feel a sharp shooting pain, don't dismiss it as normal muscle soreness. Instead, consult with a health professional and avoid any more strength training exercises until you have completely healed. Strength training benefits the body in so many ways. Not only does it help to give you a leaner and more streamlined appearance, but it helps to improve your overall athletic performance. Remember, there's truly no benefit in trying to lift extremely heavy weights when you're first getting started. Instead, gradually ease into your new strength training routine and remember to always listen to your body.